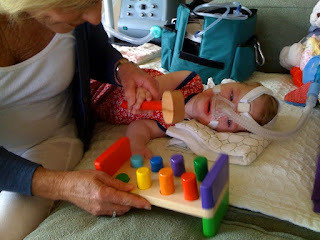 Gwendolyn Strong Foundation : Blog : New Fun Toy and a Pair of Pink Crocs! 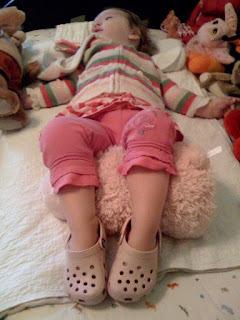 Then, we took a walk and found a pair of pink Crocs that Gwendolyn just HAD to have There was a bit of a meltdown in between the trying on of a few colors and sizes and the purchasing, but she did pretty well picking out her first pair of shoes all things considered. Shoes are challenging to put on Gwendolyn because of her contractures and the overall lack of tone in her feet and ankles. But, we thought that Crocs would be loose enough for us to slide on her feet. And...they're great! And the best part is Gwendolyn is so proud of her new "big girl shoes". She loves showing them to everyone and there hasn't been a day since we bought them that she hasn't worn them proudly out-and-about. Thank you Gramma!